Home : No Space? Try Container Gardening! If you do not have space for a vegetable or flower garden or if your present site is too small, consider raising fresh, nutritious, homegrown vegetables or try flower gardening in containers. A windowsill, patio, balcony, deck, roof top or doorstep can provide sufficient space for a productive container garden. Problems with soil borne diseases or poor soil can also be overcome by switching to container gardening. In fact, we at the Vermont Wildflower Farm grow our own vegetables and flowers, both at home and at the farm in containers. From large to small containers, growing your own veggies is healthy, cost effective and flowers are lots of fun! You can grow vegetables that don't take up much space – such as carrots, radishes, and lettuce – or crops such as tomatoes and peppers. Herbs are also lots of fun. You need approx. just 5 hours of sun for most crops of veggies, herbs or flowers, but more sun is also good. Container gardening also provides attractive garden-scaping in whatever space you choose. A boring or dull patio, deck area can be brightened by the addition of baskets of cascading tomatoes or a colorful herb mix. Planter boxes with trellises can be used to create cool places on an apartment balcony, rooftop or doorstop. Decorate window sills with pots of herbs and other veggies that don't need lots of space. It's very attractive as well. The general rule for wildflowers that will typically grow in containers is choose ones that are lower growing than 18 inches. There are a few other wildflowers that grow a bit higher that will also do well, which you can find by using our flower finder and choosing containers under the suggested uses column. Containers are made from many different materials; Clay, wood, plastic and metal are some of the suitable materials. The container you choose must be: (A) large enough to support plants when they are fully grown,(B) have adequate drainage, and (C) never have held products that would be toxic to plants or people. Consider using barrels, flower pots, window boxes, baskets lined with plastic (with drainage holes punched in it), even pieces of drainage pipe or cinder block. If you are building a planting box out of wood, you can use rot-resistant redwood, cedar or cypress. Whichever type of container you choose, be sure that there is enough drainage so that plant roots do not stand in water. Most plants need containers at least 6 to 8 inches deep for adequate rooting. You can be as creative as you want. For ease of care, place a dolly or plant stand with wheels so that you can move them from place to place. This is very helpful for balcony or patio gardens. This way you can move the plants around to insure maximum use of your space, sunlight or to avoid nasty weather, should it occur. Any good potting soil works just fine. Last season we used a combination of moo dirt and Miracle Grow potting soil and had the best container lettuce, tomatoes and green peppers you can imagine. Our herbs were delicious and our wildflowers were healthy and full! In fact, everything we grew in our Veggie Container gardens was delicious and our flowers were awesome! It's also nice to just walk out on your patio or deck and get stuff for a fresh, homegrown salad or read in an area where you are growing containers of flowers. 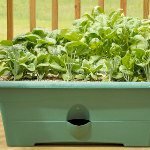 Plant container crops at the same time you would if you were planting a regular garden. Fill a clean container to within one-half inch of the top with a slightly dampened soil mixture. Sow the seeds or set transplants according to instructions on the seed package. Put a label with the name, variety and date of planting on or in each container. After planting, gently soak the soil with water, being careful not to wash out or displace seeds. Thin seedlings to obtain proper spacing when the plants have two or three leaves. If cages, stakes, or other supports are needed, provide them when the plants are very small to avoid later root damage. Make sure you pay attention to watering your container plants. The volume of soil is relatively small so containers can dry out very quickly, especially on a concrete patio in full sun. Daily or even twice-daily watering may be necessary. Apply water until it runs out the drainage holes. On an apartment balcony, in order to avoid mishaps to those below, just put a drainer pan with rocks or chips to avoid spills. Never water so much that your container is soggy or standing with water. WHAT NEXT: just wait until they begin growing and enjoy your own veggies just outside your door! These same methods apply to growing wildflowers in containers! Let us know how it goes and if you have any questions, just contact us! See below for some Veggies and Flowers that grow well in containers!